Hello everybody, welcome to another report on the most watched guitar tutorials on TheGuitarLesson.com. I created this series of posts to share what thousands of students on the site are learning each and every month, hoping that this will get others excited about learning more songs. Based on my experience as a guitarist/teacher, I truly believe that learning to play songs from early on is the key to sticking with the guitar, and improving at an acceptable pace. Playing songs is what makes playing guitar fun and motivating! So get your guitar ready, let's go through what other students have been learning in July. Do you love the sound of authentic Spanish guitar? If no, than please go to number 4 in the list 🙂 If yes, than this is your day! The Spanish guitar lesson on TheGuitarLesson.com has been one of the most popular lessons since forever. It sounds great, and it's pretty easy to master, even for beginners. This popular love song by Elvis Presley will help you learn more chords, and improve your chord changes. It only has 1 barre chord, so the song is more than suitable for beginners as well. You should definitely give it a go! 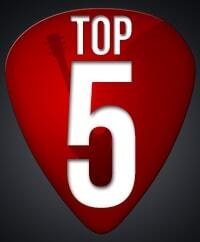 Stand By Me is a barre chord song, and usually isn't on the top 5 list. This song is great for practicing your barre chords, so I'm guessing this is why it's on the list this month. Beginners giving those dreaded barre chords a go. Keep at it, it'll come with time. This concludes the list of the most watched lessons, I hope you found it an interesting, and moreover, motivating read. Now grab your guitar, get in tune, and learn one of these songs!